While many fans lashed out at the grammatical mistakes, some broke the mantra down for him. 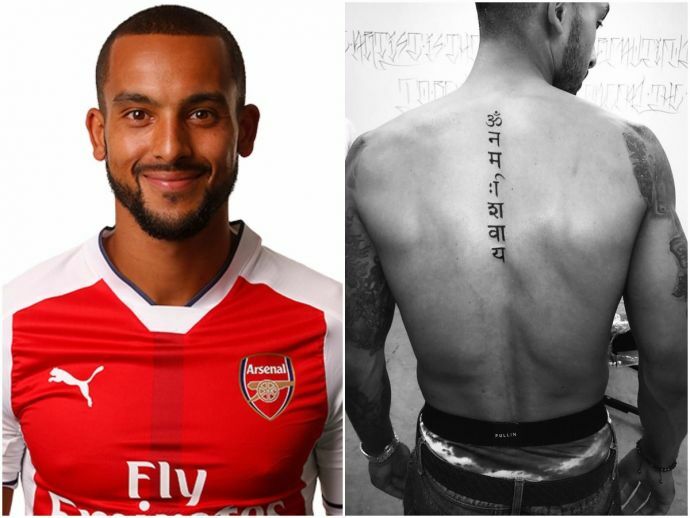 Arsenal forward Theo Walcott recently posted a picture on Twitter showing off his new tattoo that reads “Om Namah Shivaya” running vertically on his back, one of the most well-known mantras of Hinduism that is used to revere Lord Shiva. Many fans lauded the English footballer for his new tattoo. However, there was a small spelling error in the tattoo that Walcott flaunted. While many fans lashed out at the grammatical mistakes, some broke the mantra down for him. Your tattoo guy kinda messed up, y'know. You've got incorrect letters. Last 3 letters mean dead body. Need to fix it. Fix it as shown in this photo. Yeah. It looks cool and all, but the breaking of the alphabets is just wrong. @theowalcott should have checked with an Indian Gooner first. Theo Walcott is getting a BJP ticket in 2019. Walcott, who has over the years shown his love for tattoos, had earlier inked four words - “Beautiful, Blessed, Strong, Intelligent” in Sanskrit on his right wrist. The words are dedicated to his family. After the 4-3 win against Leicester City on Saturday in the opening game of the 2017/18 Premier League season, Arsenal will take on Stoke City on Saturday, 19th August at the bet365 stadium in Stoke-on-Trent, Staffordshire, England.